Meningitis is medical term for infection of the membranes and cerebrospinal fluids (CSF) covering the spinal cord and the brain. Viral and bacterial infections are common causes of this condition, but it can also be provoked by some fungi. Meningitis due to some bacterial infection is usually more dangerous than viral meningitis and patients have been seen to suffer from hearing loss, learning problems, brain damage or even lethal consequences. Viral meningitis doesn’t require any treatment, for human immune system is usually powerful enough to deal with this problem on its own, without any medications. Meningitis may also be responsible for loss of arms or legs, mental retardation, seizures or stroke and the incidence of such consequences is some 11 to 20%. According to the statistics, in the United States, meningitis caused by bacteria is the leading cause of death in children from 2 to 18 years of age. About 10 to 15% of all meningitis patients die every year because meningitis, even after they receive proper antibiotic treatment. Therefore, prevention is extremely important for this condition and the best way to do so is vaccination. 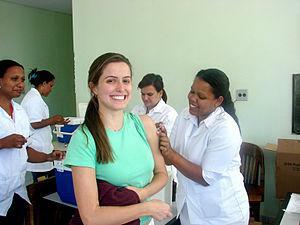 Meningitis vaccine is usually given into the deltoid muscle of the arm, just below the shoulder. It doesn’t hurt more than any other vaccine you had. The more relaxed you are, the less it will hurt. Some people may experience slight discomfort in the arm, on the vaccination spot, but this usually passes on its own after two or three days. Risks of meningitis vaccination are considered to be minimal. The vaccination site may be red or swollen for some time and some people complain about headache, malaise, fever or chills. There are very few serious risks associated with meningitis vaccine, but some patients have reported: high fever, hives, skin rash and swelling of the face and mouth. Breathing problems and seizures were also reported in small number of people who received this vaccine. How Long Do Effects of Vaccination Last? Meningitis vaccine against Hemophilus influenza type B (also known as Hib) is given to children younger than 5 years of age in several doses (3 to 4). The first dose is given at 2 months of age, than at 4 months, 6 months and then to 12 months old child. Kids who received this vaccine are protected for next 15 years or even more. Children under 5 years of age may also receive pneumococcal meningitis vaccine (PCV7). Similar - PPSV meningitis vaccine is recommended for adults and children exposed to increased risk of meningitis. Both of these vaccines will protect the person for next 3 to 5 years. There are two vaccines against Neisseria meningitidis (causing meningococcal meningitis), called MPSV4 and MCV4. MPSV4 is only vaccine for people over 55 years of age, while MCV4 should be given to older children (11 to 18 years of age) and in 0 risk group, to people from 2 to 55 years old. These protections also last from 3 to 5 years.